We’ve tried to include the most varied testimonials, if you didn’t find the information on your health issue here or in the videos please email us. I have found taking 10 drops x 2 per day to really make a significant difference to my energy levels and general sense of wellbeing. It is a sublte difference but when I tune into it energetically, it really feels as though my cells are being nourished, and that my body is being supported to right itself, particularly my digestive system, which as you know has been an area of weakness. I have also noticed a difference with my skin and hair (even though I have stopped the MSM for over 2 months), my hair is softer, regardless of which conditioner I use, and my skin looks smoother, younger....yipee! running two businesses and no free time.Constantly thinking of taking a 3 month holiday to some relaxed deserted paradise. I didnt want to take supplements i was sick of them and had no intention of taking any pharma drugs. A friend of mine sent me a bottle of your Fulvic Acid and i began taking the drops. I noticed after the 2nd day i was not tired that day at all, on the 3rd day i felt so comfortable in my body I couldnt believe it, it's hard to describe as i was more or less healthy when i took it, the only way i can describe it is, i felt fantastic, comfortable with a brilliant nice feeling especially round my chest. Im reading my notes i wrote back then i was so excited, a couple of days i went for the 30 drops and at times i felt like dancing about whilst in meetings haha, the first 2 weeks of taking Fulvic acid were so fun, I'd say in summary , it made me feel better stronger and happier, i never had any medical tests of before or afters but the only way i can describe it is, I felt like the summer had flooded back in to my body warmed me up healed anything that needed to be healed and given me the most vital collection of minerals my body had probably craved since i was born. He suddenly thought to rub it in to the area on my upper arm, within hours it was gone. Since I was around 50 I had to get up for a pee in the night. I noticed on the very first night after having tried this unique fulvic acid that I hadn’t needed to get up. No other fulvic acid ever did that for me before. Also, I found my weight regulated itself. I found myself wanting to reduce my food consumption, particularly of grains which was a surprise. Equally surprising was that I did not miss them. I was not hungry as I would have supposed I would be. It involved no effort at all. Incredible. I ran across fulvic acid quite by accident and started using it as a preventative supplement for various conditions. I noticed that I had more energy, better concentration and a general sense of better health but found another interesting effect. Fulvic acid is a chelator that helps detox the body. I think it took the nicotine and other pollutants from smoking out of my body so that I no longer had the strong cravings. In fact, sometimes I found the cigarettes distasteful so I just quit. The one problem I had with quitting was the physiological reaction of my lungs still wanting that feeling of being filled by the smoke. I solved that just by inhaling and exhaling as if I was smoking without the smoke and it reduced those cravings. I've been off cigarettes for two weeks now. As Samuel Clements aka Mark Twain said, quiting smoking is easy, I've done it hundreds of times. Well so have I. I have a feeling though, this time will be my last time quitting. I just am not having the cravings I had the other hundreds of times I tried quitting and it's just been so darned easy. If this isn't detoxing, I don't know what is. I've been trying a fulvic/humic combo and cannot believe the results! After 9 years of being pregnant or nursing I've got my mojo back with a vengence this is a wonderful thing for my marriage believe me LOL I am happier, I have tons more energy, I am laughing and joking and getting so much accomplished it's not funny LOL After years of trying every lotion and potion out there, this (next to mineral drops) this is hands down the best thing EVER! I found a raw food family in British Columbia that sell real raw food that started carrying it. I hear not all sources are created equal ;-( It's been amazing with my kids, they are playing for hours on end without bickering (we homeschool so they are together all the time)... Amazing stuff! but i contracted herpes afew days ago the rashes spread down my legs and everywhere, really nasty was going to get the prescribed anti-biotics , then tryed FA on it, rubbed it in, by the evening the rashes were gone, wow! very impressive. I started the Fulvic acid last Tuesday night, so almost a week now. First thing I noticed for the first few nights, I had to get up 3 to 4 times to wee. Now this has been a feature of being pregnant, at various different stages of the pregnancy, so I have been careful to differentiate. These frequent night visits to the loo were indeed different, much more volume, progressively lighter in colour (sorry if this is too much information lol! ), coupled with needing/wanting to drink more water. Also, the first 2/3 days brought on a lightness and a mental clarity that I haven't felt in SO long! It was wonderful. Like a fog lifting. Clear and focused thoughts and I got so much work done (all the admin I had been procrastinating!). I also noticed a marked change in my skin over the first few days. A day or two of various spots and abrasions coming to the surface, and then a rapid improvement as the week has been progressing, to a now almost clear state. I now realise just how powerful a detoxant, the Fulvic Minerals are, and the radical effect they have upon us at a cellular level. It's equally important, I feel to keep one's nutrition to a high quality, well balanced level and be diligent in making sure you are getting enough high-quality protein, complex carbohydrates and 'good' fats, whilst using Fulvic Minerals. Fulvic really is a powerful detoxifying agent and a powerful extractor/carrier of nutrients from food to receptor sites - so it really is key to maintain a high quality daily food intake. Some of the detoxifying side effects, the skin changes, mood, energy, the headaches and the visits to the loo, remind of times when I have previously tried to detox, using perhaps only fruit and vegetables etc, and similarly, by sticking with those types of detoxes and persevering through the body cleansing itself of various toxins and heavy metals, i have always come out the other side, so to speak, feeling wonderful and energised like never before. I very much feel the same way using the Fulvic Minerals, I can feel the fog lifting again as I progress towards the start of week 2. I am being mindful to increse my daily dosage very very slowly, and similarly allowing my body to detoxify slowly and heal. Unlike, previous attempts to detox, where one is usually only able to keep up the detox programme for a very short time and inevitably goes back to eating/drinking normally again. 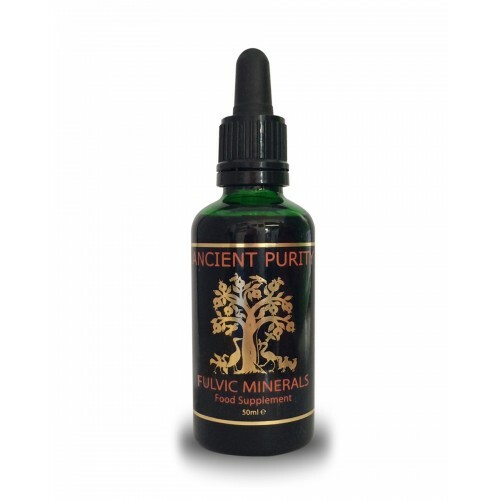 The Fulvic Minerals seem to me, not just a quick fix, but something I want to integrate into my diet for longterm. Rather than being a quick-fix detox/body cleanse, Fulvic Minerals, having completed their cleansing process, then have the added bonus of being super-efficient nutrient delivery messangers, making sure that we receive the optimum nutrient levels from the food we eat, and bolstering up our modern day nutrient deficient daily food intake with a high quality, full spectrum of minerals. Particulary reassuring is the vast array of trace minerals they contain, those we could possibly never hope to include in our daily food/drink intakes, due to leading busy lives, due to inavailability of high quality fruit, veg, meats in our shops/supermarkets, due to budget constraints and not always being able to afford to buy the highest quality foods and overall, due to said foods coming from soils that are depleted beyond repair by pesticides and fertilisers. My experiment goes on and I have high hopes that very soon, my new baby will be receiving a full spectrum of minerals via my breastmilk! Im really amazed nearly twenty years of constipation problems have ended, it wasnt really effecting my life but wow im so glad its over i feel much more comfortable. Also i've always had cold fingers, they would go numb the moment I went out in the cold. Within two days of starting the fulvic minerals my fingers are normal again, no more numbness. I have so much more energy now, I feel better in my body, lighter and i am sleeping more soundly too. My burn healed within a two days and within three it was hardly even noticeable. My skin feels softer and my hair seems stronger, i am not shedding hair as i used too. Will be re-ordering after this one.